1 of 2 Cut stem and skin from pineapple. Cut crosswise into 1/4-inch-thick slices; cut slices into quarters; cut core from each piece. 2 of 2 In large skillet, melt butter over medium-high heat. Stir in brown sugar; simmer for 3 minutes. Reduce heat to medium. Stir in pineapple; cook for 1 minute or until pineapple is heated through. Transfer pineapple with syrup to medium-size bowl; let cool. 1 of 3 Heat oven to 425 degrees F. Coat 9-inch-square baking pan with nonstick cooking spray. In large bowl, combine flour, sugar, baking powder, ground ginger and salt. With pastry blender or two knives, cut in butter until texture resembles fine crumbs. Stir in 1/4 cup crystallized ginger; reserve remaining ginger. Make well in center of flour mixture. Add milk; with fork, gently stir until just evenly moistened and dough comes together. 2 of 3 With floured hands, press dough evenly into prepared pan. Sprinkle the top with the reserved crystallized ginger; gently press the ginger into the top of the dough. 3 of 3 Bake in 425 degrees F oven for 20 minutes or until golden and toothpick inserted in center comes out clean. Let cool in pan on wire rack 10 minutes. Remove from pan; cool, right side up, on wire rack, until room temperature. 1 of 2 In a large bowl, beat together the heavy cream and light-brown sugar until stiff peaks form. 2 of 2 Assemble cake just before serving. Cut shortcake horizontally in half. Place bottom layer, cut side up, on platter. Spoon some syrup from pineapple mixture onto each cut side of the shortcake. Reserve a few pieces of pineapple for top. Arrange remaining pineapple on bottom half. Reserve about 1/2 cup whipped cream for top; spread remaining whipped cream over fruit. Cover with top half of shortcake, cut side down. 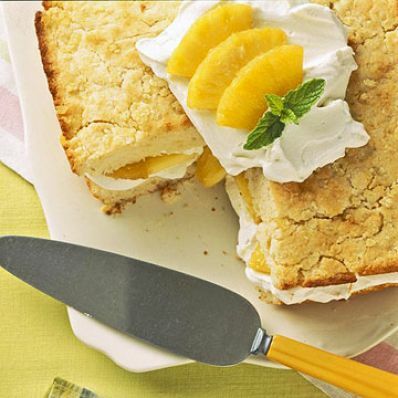 Garnish top with reserved whipped cream and pineapple. Serve immediately or refrigerate for no more than 1 hour.